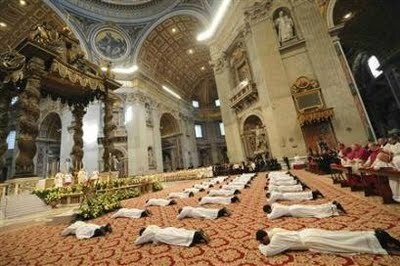 Holy Orders is the name of the Sacrament received by men who wish to be of service to the Church in consecrated life. Those who receive the sacrament of Holy Orders—as a deacon, priest or bishop—are consecrated in Christ's name "to feed the Church by the word and grace of God." This Sacrament is given by the Bishop during a special Mass at which these men receive the power of the Holy Spirit through the Bishop’s laying on of hands. If you are interested in discerning Holy Orders in the Diocese of Birmingham, please speak to the Pastor by calling the Parish Office at (256)353-2667. For additional information on vocations, please visit the Diocese of Birmingham in Alabama Office of Vocations Page. Please also visit the United States Conference of Catholic Bishops Vocations Page.